It was somewhere in the middle of the communist state of the Lao People's Democratic Republic as Laos is officially know that I found myself journeying down the Mekong River in the hull of a narrow wooden “longboat”. The boat was perhaps 20 feet long and 3 feet wide and the passengers sat somewhat crouched underneath a thin cover of battered tin overhead, in the back of the boat a hulking engine connected by weathered rubber tubing to several large water bottles full of gas puttered along blowing a cloud black smoke behind. At some point in China's Qinghai Province several tributaries coalesce to form the nasnscent begingings of the Mekong River. Along its 2,600 mile stretch it courses south across Tibet, then along the border of Myanmar and Loas, cuts a swath through the middle of northern Loas, and later forms the Thai Loa border before it courses into Cambodia. Eventually the slow waters make their way into Vietnam forming the Mekong delta before empting into the South China Sea. The Mekong to be sure is one of the great rivers of the world and if only I had the time to explore ins entire length, for now though I guess I can be content with my small journey. Its impossible not to marvel in awe at the serene majesty of the abundant towering cliffs scattered along the banks as the broad waters of the Mekong gently float by. To be sure a trip down the Mekong offers a certain degree of excitement not otherwise possible in other part of the world. Trees cling almost vertically to steep limestone cliffs soaring perilously high in the air. The cliffs seem endless, appearing one after another down stream, the further the cliffs the more progressively faint they become until at some point the purple pastel outlines disappear into the mist. 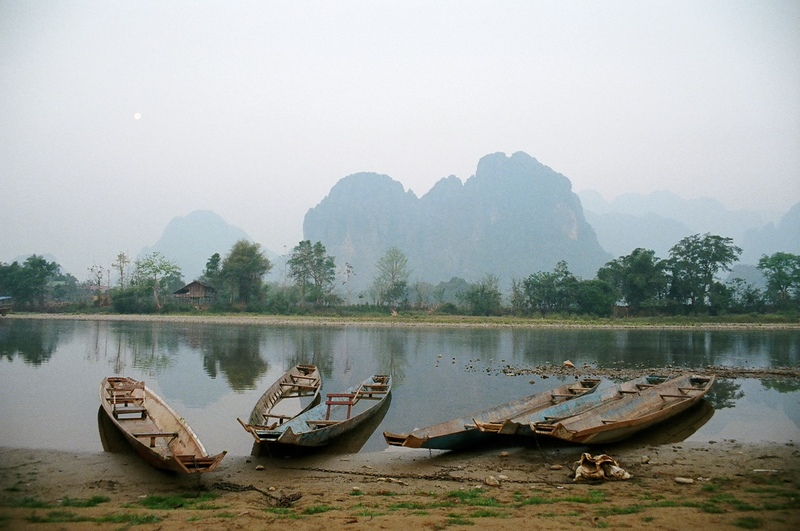 The longtail boat set off from the seat of the ancient capital Luang Prabang. Scenic fishing villages with small wooden boats moored along the vast muddy banks add to the rich milieu of river life. Villagers are friendly and when a visitor steps off the longboat its not uncommon to be offered rice whiskey and a Laotian dose of hospitality. The H’moung villagers fish with large nets and bamboo poles on the shores around a bend in the river. The river is at times deceptively tranquil belying the occasional rapid as the boatman constantly scourers the waters for the myriad jagged rocks which lurk just above or slightly below the shallow surface. The quietude of the slow waters is occasionally broken by small speedboats with motors almost as loud as they are large heading upstream to the Thai border. A memorable journey to be sure. Further on down the brown river lie the white caves of Tham Ting and Tham phum . The brilliant temples are carved into the limestone and the caves are adorned with literallally thousands of Buddha statues both big and small in the capacious bowels of the cave. Any one of the thousands of Buddhas would make a seemingly priceless artifact in the west but in the cave they are just another Buddha. I initially arrived in Luang Prabang by propeller plane. The plane from Vientiane to Luang Prabang was many things if not interesting as it creaked and cracked through the air with the heavy hum of the dual propellers cutting loudly through the thick air. Monks clad in bright orange robes seem to outnumber even the ubiquitous mosquitoes in Luang Prabang. As their daily morning ritual dictates they amble along the narrow streets single file gathering rice in copper bowls from the faithful that will serve as a large part of their sustenance. The town is replete with temples, wats, monasteries, and monks both young and old. 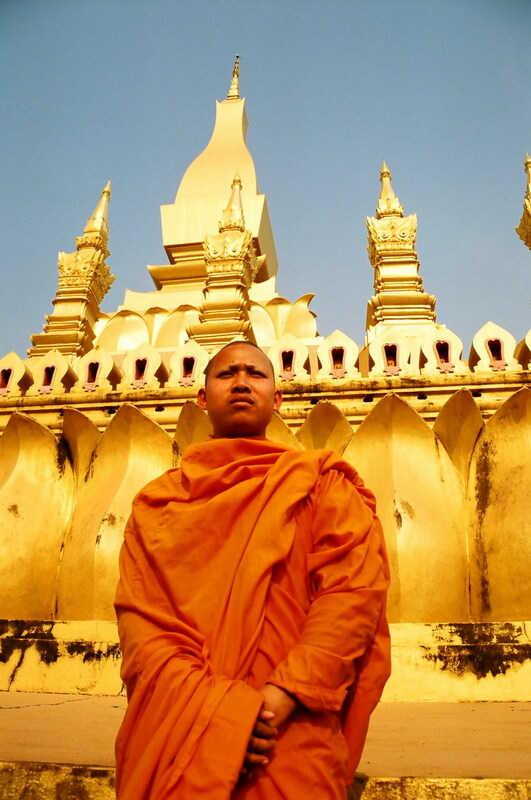 Luang Prabang is probably best known for its more than 30 temples some dating back to the 1500’s. Each temple is a marvel to observe with gold tiles and layered low sweeping roofs. Most of the cities temples sit high on a hill at the confluence of the Nam Khan and Mekong Rivers. Leaving Luang Prabang I took a motorcycle sidecar to the local bus station on the dusty outskirts of the small town and managed to sort out a local bus to the town of Vang Vieng. I boarded a bus filled with some backpackers and many locals for what would prove to be a lively and interesting trip. The bus was quite beyond full to say the least and even the isles were crammed with people. As the bus took off for the 9 hour journmey I looked at my surroundings and to my left sat a guy in the isle who sat with a Kalashnikov machine gun resting on the floor between his legs. As the ride continued he kept dozing off and the gun would rock back and forth almost falling to the ground….. I presumed that Kalashnikovs have safeties or at least that’s what I hoped. At some point in the night along a desolate stretch of road in the mountains the bus came to a stop for no apparent reason. The stop lasted for a while and then even longer. Eventually it became apparent that something was wrong with the bus. I climbed over the isles full of people and stepped outside the bus for some fresh air. A few other backpackers also hung out outside and we chatted about our travels as backpacker are prone to do. The roadside detour ended up lasting about 3 or 4 hours. The bus driver and a few others rigged a light bulb by wire to the bus battery and then took off one of the tires and a large metal piece off the axel and began hammering away with a large crowbar at the poor piece of metal nearly the whole time, whatever they were trying to fix it looked like a futile effort but eventually they somehow bashed the piece back into place and we were on our way again through the dark night. 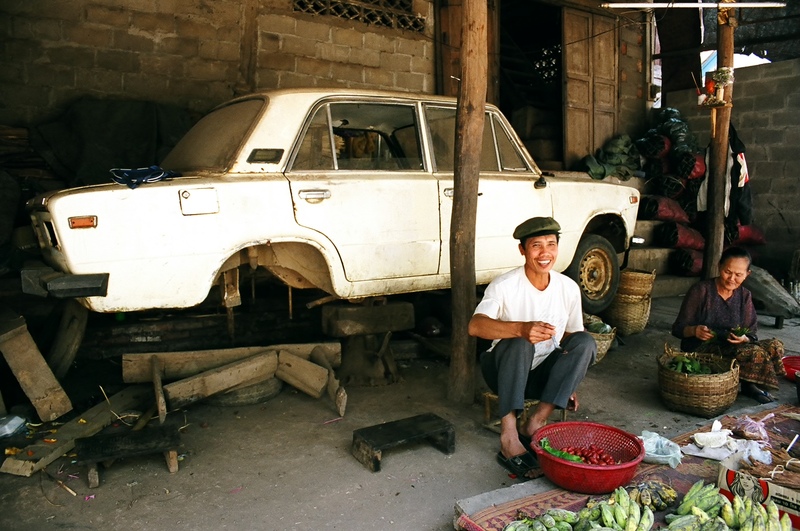 Roadside mechanics, Laotian style…..
How I found myself on the back of a truck with a group of Dutch hikers in the Loatian countryside is a bit random but made for a fun day hanging out with them. The truck left the town of Vang Vieng early in the morning and dropped us off and we first hiked to a small cave. 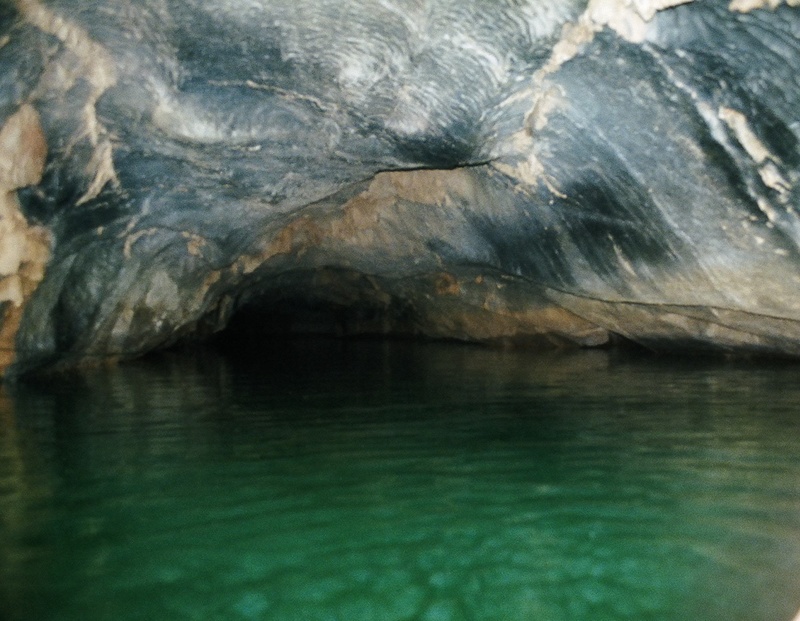 The opening to the cave was a small pond that flowed into a narrow mouth on the side of a diminutive mountain. Over the eons water has carved a network of caves and rivers though the soft limestone forming a vast labyrinth of rivers in the caves. The murky river that flowed into the cave was long and pitch black and the unmistakable smell of sulfur and stale water pervaded the heavy damp air inside. The water was cold and the only lights in the cave were the makeshift headgear spelunker lights attached to large batteries illuminating the way. Our voices echoed loudly and even drops of water falling from ancient stalactites clinging to the ceiling just above seemed to resonate throughout the cave. It was an inner tube ride the likes of which I’ve never experience before (not that I’ve ever been cave inner-tubing before or non-cave inner tubing for that matter) as we floated for two hours into an abysses of darkness and excitement. Eventually we found our way back to the entrance and began hiking again in the sun. The rest of the day we hiked to other nearby caves but these we explored by foot as they were dry but no less interesting. The rest of the Loa countryside was nothing short of amazing. Lonely huts bask in the shadows of towering cliffs as water buffalo graze alongside abundant rice fields littering the plane. Bamboo bridges span small rivers and watching the sun set in the evening can become somewhat of an addiction. Landing in any country one of the first priorities is to obtain the local currency. I flew into Loas’ Capital city of Vientiane from Bangkok. At the airport I changed 100 USD for the Lao unit of currency the Kip and became a millionaire of sorts, or at least by Lao standards. I was handed a 3 inch thick stack of single 5000 Kip notes, I stuffed the nearly 1,000,000 units of Kip currency into my backpack and headed outside to make my way into the city…..
On certain sunny days when the sun is not obscured by clouds there is a precise moment when the sun glows its warmest yellow and all thing that imbibe its gentle rays resonate with a soft glow. And so it was that I had an opportunity to visit Laos’ most famous temple a few hours before sunset when the sun was at its most radiant. The Pha That Luang Temple is a large stupa painted a bright gold with curvilinear edges and giant flower-petal like protrusions at its base. Monks wander around in vivid orange robes with purple sashes. The monks are friendly and gregarious in their own way and enjoy communicating in their broken English with visitors to the temple. Laos unlike parts of the rest of Southeast Asia is not a pushy place and its hospitable people seem content to have you in their country. Exploring Laos one finds that things are not contrived and the people seem sincere and are not keen to sell you this or that.